I think this was one of the first dinner party dishes I made after I got married. It was quite modern then with the wine, garlic, oregano and peppers and tasted great. I’m not sure where I got the recipe from, but I can see from the typing that I typed it up on a manual typewriter, probably at work, and here I am posting it on the internet – how the world has changed!!!! It served me well all those years ago, but I haven’t made it for awhile. Perhaps it’s time to give it another go. 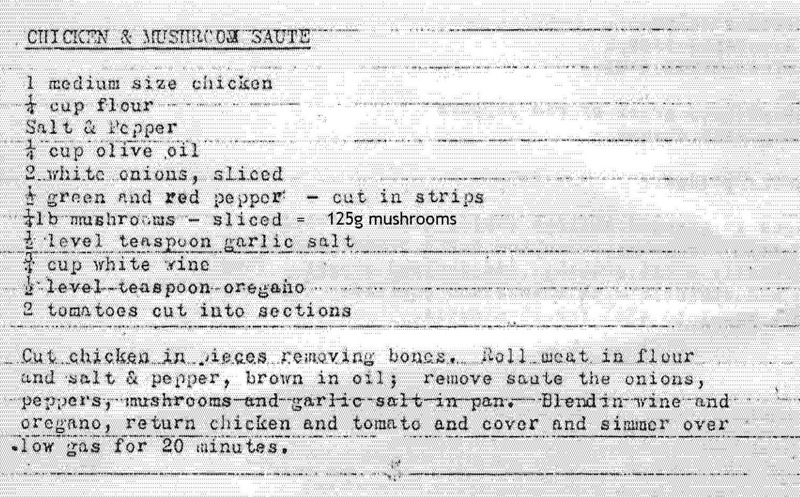 This entry was posted in All Recipes, Chicken, Main Dishes and tagged 1970s, chicken, chicken and mushroom saute, garlic, green pepper, mushroom, oregano, red pepper, tomatoes, white wine by bebsrecipes. Bookmark the permalink.